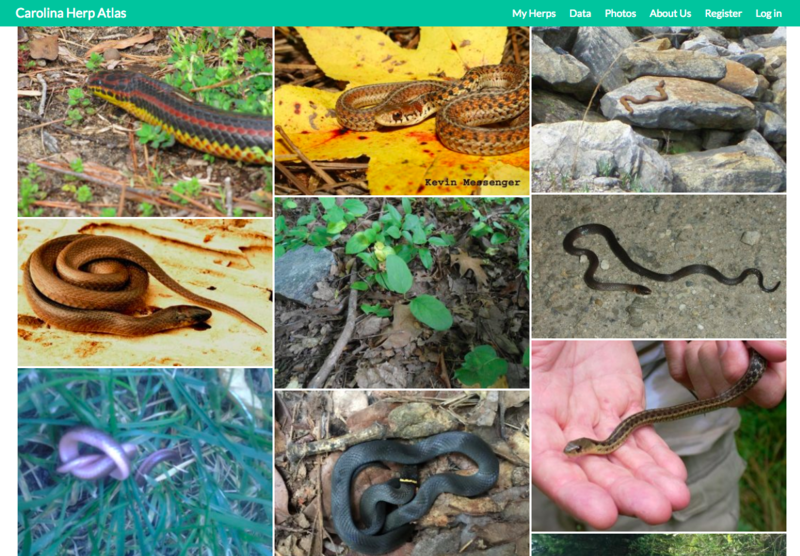 Featured Photo: A screenshot of snake photos submitted to the the Carolina Herp Atlas. Samuel L. Jackson in Snakes on a plane. Photo source: Refinery29. Snakes have been the subject of the worst smear campaign in history. Their representation in movies ranges from Anaconda (1997), about a giant, human-eating anaconda (“They got snakes this big?”), to the outlandish, horrifying cultural phenomenon that is Snakes on a Plane (2006). Spiders or mosquitoes may sometimes get a bad rap, but snakes have traditionally been associated with the devil. It’s hard to get much worse than that. While a fear of snakes is one of the most common phobias, many open-minded scientists and science-lovers remain undeterred. They’re called “herpers” — professional and amateur herpetologists who search for amphibians or reptiles and collect important data about their habitat and behavior. Herpers fill an important gap in scientific research by providing widespread data about reptiles and amphibians. Only 35% of all reptiles have been evaluated to determine whether they may be endangered, making reptiles one of the least studied groups of vertebrates. This is especially concerning because reptiles are currently losing habitat worldwide and many species have already gone extinct. (let’s keep the) Snakes Alive! In order to target our conservation efforts to the most vulnerable species of snakes, we need to know which types of snakes will be the most sensitive to habitat loss, climate change, and other stressors. Previous research on more charismatic, well-studied animals (i.e., birds, mammals, and butterflies) has found a few characteristics that generally make species more vulnerable to human modifications of their environment. Species that can only live in specific places (narrow habitat ranges), have a very specialized role in the ecosystem, or are high on the food-chain (top predators) tend to be the first to go when their habitat is disturbed. However, until recently, there was no way to evaluate which types of snakes would be the most vulnerable; there simply weren’t enough data. The few scientists who were willing to suffer the scorn or disgust they may get for studying one of the most loathed animals worldwide could not possibly survey every area of land where snakes exist. Instead, scientists worldwide have tapped into an active network of amateur herpers to collect critical data about the populations of reptiles and amphibians worldwide. In this study, Dr. Brian Todd from the University of California and his collaborators used a dataset collected over the course of eight years by citizen scientists in North and South Carolina. Using this incredible resource, the researchers were able to determine factors that make some species more vulnerable to the impacts of human civilization than others. Distribution of Agkistrodon contortrix (copperheads) in North and South Carolina (screenshot from the Carolina Herp Index website). Citizen scientists created the monumental dataset by reporting every observed snake to the Carolina Herp Atlas (www.carolinaherpatlas.org). To report an observation, the participant enters the name of the species, the date it was observed, the county, and a precise location. Each user is also encouraged to upload a photo and provide comments about the animal’s location and behavior. All in all, citizen scientists observed 7,684 snake occurrences, including observations from every single county in both North and South Carolina over the eight-year study period. Armed with this incredible dataset, researchers quickly got to work. Staff at Davidson College validated the citizen science data by reviewing every observation, while other researchers ranked how “natural” or “human impacted” the landscape is across both states. By relating the number of snakes of a given species found in natural vs. human-dominated areas, researchers were able to determine the sensitivity of each species to human disturbance. As with mammals, birds, and butterflies, snakes that are top predators or have very narrow habitat ranges were the most sensitive to human land use. However, snakes that require aquatic habitats were also more sensitive. Top predators are particularly vulnerable because they often require large amounts of space and any affects on animals lower down the food chain will decrease the amount of prey for them to eat. At the same time, species with narrow habitat ranges are in danger because they have more difficulty adjusting to habitat changes. Aquatic snakes are severely affected by human land use because they rely on freshwater wetlands that are often paved over or contaminated near human settlement. By identifying three factors that make some snakes more vulnerable than others to human land use, this team of researchers and citizen scientists filled an important gap in our understanding of snake conservation. Their results will help target future conservation efforts towards ensuring that there are sufficient natural areas for snakes and other wildlife, and put special emphasis on the presence and quality of freshwater wetland areas. As this study shows, citizen science often fills critical gaps in scientific research and conservation. It can also be a great opportunity for people of all ages to learn about science! If you or your family have an interest in getting involved in citizen science projects, check out https://scistarter.com/ for opportunities near you.